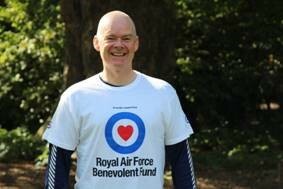 Former Squadron Leader Pete Thompson, of St Arvans, will tackle the 240-mile challenge on a Brompton bike to raise money for the RAF Benevolent Fund. He is among more than 50 cyclists who have signed up to take part in the Battle of Britain Paris to London Brompton Bike Ride this September. There were nearly 3,000 aircrew who fought in the Battle of Britain from more than 70 Squadrons. The cost of the battle was high – 544 lost their lives and a further 814 died before the end of the War. But it seems not everyone in Britain is aware of the battle and the ultimate price paid by so many of ‘The Few’ – the Spitfire and Hurricane pilots who took on the Luftwaffe in the skies above Britain in 1940. In Wales, 40% of those asked in a recent survey commissioned by the Fund, said they did not know what the Battle of Britain was with 7% of those asked believing the battle took place in 1646. Half of those living in Wales did not know who The Few were, and 8% thought they were a group of spies! The survey, carried out by Opinion Matters, questioned 1,000 people of all ages on their knowledge of the Battle of Britain. The cyclists will tackle the 240-mile course over four days riding Brompton bikes, something Pete has prepared for. He said: “I have been training on an old bike my friend gave me. It is heavy, the gears are a little clunky, the brakes don’t work and I have been doing all my training in the Wye Valley which is not easy. The idea being that when I sit on the Brompton it would be like going from a Robin Reliant to a Rolls Royce! It is hoped 75 riders will take part in the ride, each raising £1,000 to support the work of the Fund in providing emotional, practical and financial support to the entire RAF family. Riders need not have a connection to the RAF or a Brompton bike to take part in the challenge – just an interest in having fun!